Part One of Two: Outside the U.S.A. Most of us in the “Western World” did not under-look the partial Solar Eclipse of Epiphany 2019. However, we should not overlook its remarkable relevance as we move into 2019. The synchronous dynamics of eclipses build up beforehand, culminate in dramatic spectacle, but resonate for at least months thereafter. I almost overlooked this important phenomenon, but I had “an epiphany.” This came to me on the most appropriate day of the year for such, the traditional “Christian” celebration, January 6, “The Epiphany.” This day in 2019 was also when planet Uranus’ retrograde dramatically ended. The legend of The Epiphany is the story of the visitation of the recently born Christ child by three astrologers, or astrologer-kings, who supposedly followed “a star” to find a newborn king. They brought three gifts appropriate for a king: gold, the royal metal, frankincense, used for spiritual and medicinal purposes, and myrrh, for anointing and embalming the king shortly after birth and just after death. The legendary three astrologers were sometimes depicted as wearing soft floppy felt Phrygian Caps. It is written that the lining of each cap was lined with stars, so that day or night the astrologer had the night sky “on his mind.”* Ancient Rome’s freed s;laves wore similar caps. 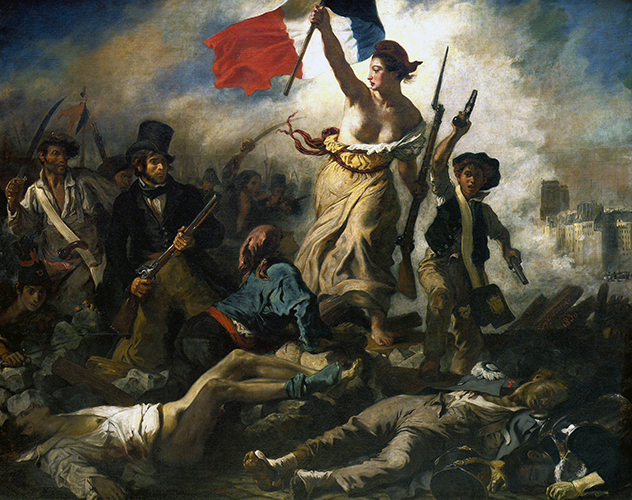 In their spirit of liberation, French activists sported red versions of the same, as did “Marianne”, the symbolic spirit of France, famously seen in Delacroix’s painting. The ordinary way of things annually (Solar cycle-determined) is ordinarily reassuring. However, when a Solar eclipse occurs, even a partial one, the ordinary way of things is “eclipsed.” Darkness, even partial darkness, is disconcerting. Epiphany is the twelfth day of Christmas. An eclipse on this day breaks the usual “holidays over, back to normal, back to work tomorrow” expectation. Hmm. Have you felt uneasy lately? If so, that’s likely to be intuitive astrological attunement, not some paranoia to suppress with distraction or medication. So, “What’s up” in the celestial sky with this eclipse? “What’s comin’ down?” Answer: lots. One place to look is where the eclipse was visible: from parts of Asia to westernmost Alaska. This included from mainland China in line with Taiwan. China recently “sabre-rattled” possible war actions against Taiwan. That fits. What else? When the partial Solar Eclipse occurred, around the world each planet (and such) appeared to be somewhere overhead, somewhere rising, somewhere setting, etc. As a Jim Lewis-Certified Astro*Carto*Graphy Interpreter, I know that the A*C*G world map of an eclipse can be very instructive, if one knows where to look. Since within less than 24 hours, planet Uranus seemingly stood still, that particular planet is demanding our attention, astrologically speaking and in regard to Astro*Carto*Graphy. This important advice is relevant in at least two ways. First, most modern “Western” astrologers speak of outer planets, including Uranus, in abstractions. Abstract clichés for astrological Uranus could be perhaps innocuous, maybe even helpful in other contexts, but what are they missing now? Second, what are the obvious messages demanding to be heard at a human level? Just look at Uranus’ dramatic expressions around the globe as indicated in the A*C*G eclipse map. Some places where Uranus is prominent recently and eminently: New Zealand (north island); India; anywhere in North America anywhere even remotely close to around 100 degrees West Longitude; West Africa and much of Western Europe. With so many possibilities, where should we look? The Sabian Symbol for the Solar Eclipse itself gives us our best clue. The image: “School grounds filled with boys and girls in gymnasium suits.” Such symbols are seldom meant to be taken literally, but rather intuitively, like dream imagery.” Of the geographic areas just mentioned, where are (predominantly) young people, male and female, seen in uniforms or the equivalent, covering the upper torso of the body (but not the arms) and down to the upper thighs? Answer: the “yellow vests” of France and some other E.U. nations. They have demanded attention, and they are not going away. Demonstrations in France have entered their second month. Uranus in the sky has taken a stance, and will not back down any time soon. Neither will the Yellow Jackets! Neither will the “Mariannes”! Certain particular individuals, certain particular countries, etc. are seemingly more impacted by certain eclipses. * For instance, someone born on or near, or some major organization started on or near January 5th or 6th is likely to have some radical reorientation of her, his or its story. Case in point: the Euro was first traded on stock exchanges on January 4th, 1999. (The Euro as currency was widely circulated starting 1/1/2002.) Partial Solar Eclipses look like someone or something took a bite out of the Sun, like a cookie that someone bit into. Expect the Euro to fare badly in relation to the dollar, etc. Note that the yellow jackets are not merely Parisian young males acting out violently. Across France, and increasingly in other E.U. countries, ordinary people, male and female, young and old, left wing, right wing and even former centrists have been so economically hard-pressed that they’ve taken to streets of cities and villages. Pensions are at risk. Tax-funded “free” tuition is threatened. The financial system has caused dramatic (Fire sign) actions of discontent. Astrological abstractions and political clichés do not pay their bills! So they each took their yellow safety vests from the trunks of their cars, suited up and took to the streets. French citizens polled approved the yellow vests’ demonstrations by 70 to 80%! Mythologically, Athena wore a helmet, carried a shield, and a full suit of armor, notably featuring her vest-like breastplate. Astrologically now, coinciding with the eclipse, Pallas Athena is currently in the sign of Libra, sign of the scales of justice and equality. The female “Mariannes” and yellow vest demonstrators have spoken of the need for non-violent demonstrations (in contrast to the sometimes violent and destructive males acting out the worst of Uranus in Aries). Further, they have tried to remind anyone who might listen that although there is widespread inequality, women are economically even worse off than men, in terms of lower pay, unpaid childcare, etc. If you are a woman in the U.S. who thought that gender pay inequality was merely a U.S. injustice, think again. It is, regretfully, a small unjust world after all, at least for now. In London, just across the English Channel from the Uranus line, there is concurrently controversy about the UK’s Brexit crisis relative to the E.U. “Eng-l-land swings like a pendulum do….” Roger Miller sang melodiously and calmly in easier times. Now the pendulum swings dramatically and unpredictably. In? Out? Labor? Tory? The partial Solar Eclipse occurred very close to the midpoint of Saturn and Pluto. Different planets correspond to particular metals. Saturn’s metal is lead, the heaviest element until the discovery (and human-made) radioactive element Plutonium. Note that lead is used to try to contain plutonium from radiating poisonous death. Pluto was/is the mythological Lord of Death. So, symbolically we have entered into probably the “heaviest” time ever in our lifetime, perhaps even in the history of modern humanity. By declination Sun, Moon, Saturn, Pluto and Jupiter are parallel to one another, in the year before a similar alignment by stellium in 2020. Hold on to your gym shorts (or your yellow vest). The visible eclipse may be over, but back to normal now is not in the astrological forecast for any time soon. We’ve just touched the surface of some few probabilities and possibilities related to this eclipse. Once eclipses are “over”, much will be revealed, perhaps revelations expected, but perhaps revelations otherwise. Will the gift of gold spike out of purchase range? Will more people speak frankly-incensed? Will myrrh (or mirth) embalm the dying corpse of international capitalism? Regardless, revelations by definition are relevant. Beware clinging to abstracted perceptions and theories, astrological, economic, etc. Capricorn knowledge and wisdom shows us that life is first and foremost about survival in a material world. Materiality isn’t all that there is to life, but lfe as we know it is embodied. Soul only exists where spirit is embodied. No matter our worldly challenges, individually or as a people, like the Epiphany’s three astrologers, we should celebrate Spirit’s incarnation into matter, no matter what! Part Two of Two: Eclipse, American Style: The Trumps, Wall Street, etc. •	I’m personally fortunate to have my own version of the same, in dark green velvet and festive trim. I wear it on Epiphany and rare special occasions. * : How personally relevant might this eclipse be for you? If so, how so? Consult an astrologer, if you can, if you are not sure.